In The Adventures of Huckleberry Finn, the two main characters Huckleberry Finn and the slave Jim set out on a adventure to freedom. But what is the definition of freedom to both of these characters? What are these characters running away from? What messages might Twain be sending with the actions of these characters? These are all valid questions that we will be exploring today, using specific information from the book and adding my own personal opinion to the mix. Huckleberry Finn is a 13 year old white boy who lives in St. Petersburg, Missouri. He is watched over by his two guardians, the Widow and Miss Watson. Huck used to live with this pap, Huck’s father who drink excessively and beats him on a regular basis. Even if pap was not the best fatherly figure, Huck claimed he liked living with his father more than living with the Widow and Miss Watson, due to the fact that they tried to “civilize” Huck by setting strict rules in the house. Twain writes “Don’t put your feet up there Huckleberry and don’t scrunch up like that Huckleberry-set up straight, and don’t gap and stretch like that, Huckleberry-why don’t you try to behave?”(2). Huck despises these rules imposed by Miss Watson, but he also dislikes his drunk pap. With these two facts in mind, we can see that Huck was running away from a society that tried to make him what he didn’t want to be, and from an abusive father who only cared about his next drink. Jim is a black male who is owned by Miss Watson as her household slave. Referring to the time period this book is set in, which is years before the American Civil War, slavery is still legal in United States, and racial degradation against African-Americans is common in this society. The context of slavery is clearly within the book, with Twain using the “N” word numerous times, and making references to slavery, like when Twain writes “I hear old missus tell de widder she gwyne to sell me down to Orleans, but she didn’ want to, but she could git eight hund’d dollars for me, en it ‘uz sich a big stack o’ money she couldn’ resis’.”(39) This is when Jim explained to Huck why he ran away, in which he says that Miss Watson was planning on selling him to a slave dealer in Orleans. This is the main reason Jim decided to pursue his freedom. In a racist society where he is seen as property, he was about to be sold away, and he didn’t want that and ran away. 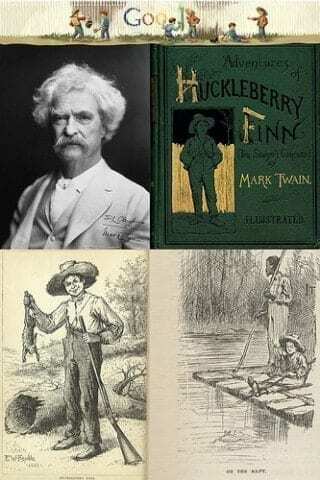 Twain is known for his humorous work, as shown with the satire in The Adventures of Huckleberry Finn. But what message was he trying to send with the actions of Huck and Jim? I believe that the message Twain was trying to convey to his audience was that two people, disregarding race, can accomplish goals by helping each other and with support. I believe this because throughout the book, Twain portrays Jim as more of an intelligent adult rather than a slave, with instances such as predicting the weather when Huck and Jim first met on Jackson island. Twain slowly whites out Jim”s racial status by showing his humanism and affection towards Huck in the book. A huge example is when Jim shielded Huck from the dead body that was flowing down the river, and we later learn that was Huck’s dad. Jim didn’t want Huck to hurt, so he did what a good friend should do. The Adventures of Huckleberry Finn has many topics that classes can discuss, like the idea of freedom. With information from the book and my own opinion, I discussed the topic of freedom and how it contributed to the book. Despite my own point of view, I would also like to hear what other students think about the topic. Twain, Mark, Diane Mowat, Paul Fisher-Johnson, and Judy Stevens. The Adventures of Huckleberry Finn. Oxford: Oxford UP, 2008. Print. The Idea of Freedom by Thomas is licensed under a Creative Commons Attribution-ShareAlike 4.0 International License. Thomas, I think you did a really nice job writing this. I totally agree with you on the idea that freedom really effects both these characters and how twain tried to implement the use of the n word to show that. When I was reading this book, I thought about the topic of freedom but I didn’t go as in-depth as you did. Nice job and keep up the good work! Thomas, you did a great job writing your essay about freedom. It looks like you put some times and hard works into it. Your essay is very well organized. I really like you used freedom to discuss the adventures of huckleberry finn, I think Freedom fits very well with the book. Your example is very clearly related to freedom, I think the freedom is huge part of the book. Huck Finn trying to free Jim could be seen as the main example of freedom. Thanks for you essay thomas. Wow, this is a very well thought out and organized piece! I can really tell you spent a lot of time diving in to voice your opinion and explaining the story. I also wrote about freedom and how it relates to the book “Huckleberry Finn” and I agreed with all of the points you brought up in this discussion! The piece you wrote help made me deeper understand the book, so thank you! Also great job, great piece and keep up the great work! This is a pretty great piece you put together. I like how you questioned what Huck is running for; I had similar inquiries when I read the book as well. I also like how you inquired what freedom is to these characters. Is it to be free of slavery? To be free from Ms. Watson? Your insights on these questions were quite excellent and I relly like what you put together here. You organized this piece very well, and that makes it easy to follow. You presented some great points about what freedom means to each individual and your opinion makes a lot of sense. I agree with what you said, in that when two people disregard skin color and racial prejudices, they can overcome a lot and achieve even more. Huck and Jim are two great examples of that. Wow, great work! I really liked your use of voice in this piece and I think it helps convey your unique writing style. I also wrote about freedom within the story and I completely agree with your piece. I really liked how you opened up the topic for discussion at the end of your piece, I think that it is important to have conversations in literature and especially with this book.